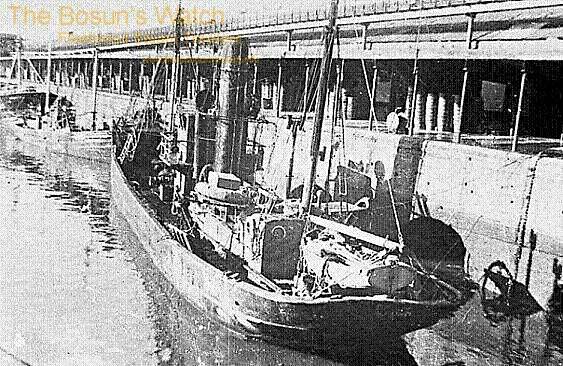 9.9.1908: Launched by Smith’s Dock Co Ltd, North Shields (Yd.No.385) for Neyland Steam Trawling & Fishing Co, Neyland as CALDY. 10.1908: Completed (Alexander Scott, Llanstadwell, manager). 20.10.1908: Registered at Milford (M228). 7.6.1911: Berthing at pontoon at Neyland collided with BUSH (M227) coaling, striking her amidships. 14.4.1915: Requisitioned for war service as a minesweeper (1-12pdr) (Ad.No.1372). Based Stornoway. 6-8.8.1916: Assisted in salvage of Norwegian steamer ARANDA (1838grt/1890) (after-part) in Lough Foyle. ARANDA had been mined 5.8.1916 between Hebrides and North Channel and was towed into Lough Foyle where she settled on bottom (Mines laid by U.boat (U78)). 14.2.1919: Sold to Jonathan Uttley, Fleetwood (Joseph A. Taylor, manager). 8.3.1919: Registered at Fleetwood (FD66). 1920: Sold to Mrs A. A. Uttley & F. A. Wadsworth (Joseph A. Taylor, manager). 10.5.1921: Sold to Joseph Samuel Pettit, Frederick Steer, Walter Edward Wales, Charles Harold Bird, Milford & Joseph Baron Bardsley Huddlestone, Hakin (Joseph S. Pettit managing owner). 10.5.1921: Registered at Milford (M198). 11.1925: At Aran District Court, fined for fishing within the prohibited area. Also in court were the skippers of KEYES (LT580) and PHINEAS BEARD (LO283). Total fines £350. 23.9.1927: Sold to Joseph Baron Bardsley Huddleston, Hakin, Frederick Steer, Joseph Samuel Pettit & Horace Samuel Fiddy (64/64 joint owners), Milford Haven (Joseph S. Pettit, managing owner). 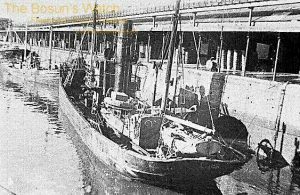 16.4.1937: Sold to Westward Trawlers Ltd, Milford Haven (Edgar Erel Carter & Richard S. Bowen, Port Talbot) (Edgar Erel Carter, manager). 4.1938: Fishing on the Western grounds (Sk. J. Binham). Connected to steam trawler ARACARI (M101)(Sk. W. Parry) which had broken down and commenced tow to Milford. 27.11.1939: Requisitioned for war service, appointed as a minesweeper (Hire rate £55.10.0d/month). 10.9.1961: Landed her last trip at Milford (Sk. Bruno Linke). 9.1961: Sold to BISCO and allocated to Thos. W. Ward Ltd, Sheffield for breaking up. 14.10.1961: Delivered Briton Ferry from Milford Haven under own power. 18/05/2012: Page published. 6 updates since then. This entry was posted in Steam Trawlers, Steamers (Picture) and tagged J. Uttley on May 18, 2012 by Fred Smith.